Unlike the authors of the original paper, I didn’t even need to fiddle with the lag structure to get such a good fit, nor test alternative definitions of the variable. In fact, my variable fits even better than vehicle miles traveled. 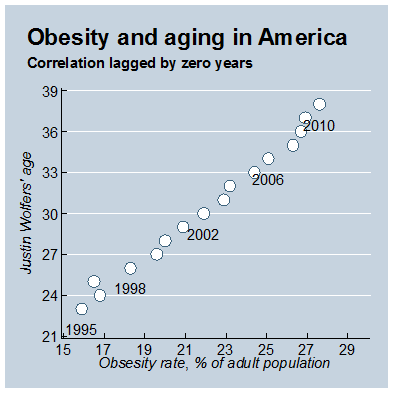 Okay, I’m not arguing that my aging is causing higher obesity. Rather, when you see a variable that follows a simple trend, almost any other trending variable will fit it: miles driven, my age, the Canadian population, total deaths, food prices, cumulative rainfall, whatever. Sure, The Economist offered the usual caveat that “correlation does not equal causation.” But this is so completely unconvincing as to warrant a different warning: “Not persuasive enough that you should bother reading this article.” I’m not saying the relationship doesn’t exist, simply that it makes more sense to highlight more persuasive research on this question. P.S. : How cool is Stata’s “Economist” scheme? It lets stat-nerds like me replicate magazine-quality art. I love spurious correlations. Back in the 80's I won myself a scholarship worth GBP 150 per year for my 3 years of Uni (a lot of money to an 80's student), partly on the back of an essay where I employed the correlation between sardine consumption and cancer to illustrate the non-causative correlation leading to some dodgy conclusions. I love sardines too, by the way. And I don't have cancer (yet?). So you're saying that when Biggie Smalls talks about how he "used to have sardines for dinner," he's looking nostalgically on the relative comforts of his childhood? They might be totally unrelated, but causality could also run the other way. As people get fatter, walking requires more effort, so they drive more. Eventually they stop considering walking as an option at all and they have no problem moving to unwalkable suburbs and driving increases again. The important question is: How can we design a conclusive study? I am not going to say that the analisys of "The Economist" is completely right, but I think you're missing the fact that their dependant variable is not necesarily trended. Note that is miles per licenced driver, which takes off much of the trend that is in the variable "total miles driven". No, you are missing a fact: if population of Canada has been increasing during the last 20 years, that time series is going to be correlated with obesity percentage time series. That is all Justin was saying: two trending variables are bound to be correlated. There was a similar article in the Economist a while back. I believe it was on the correlation between posture and leadership abilities. I recall questioning the lack of skepticism in that report, too. It gets into the weeds some on LPL and insulin but it's a great, an scientific exploration. That's a good post, Jacob. Doesn't say much about driving, does it? I agree with the post: The Economist just wasted a bunch of time by doing this study. Not only did they not have enough data to determine if this correlation was of any value, but the correlation is spurious at best. 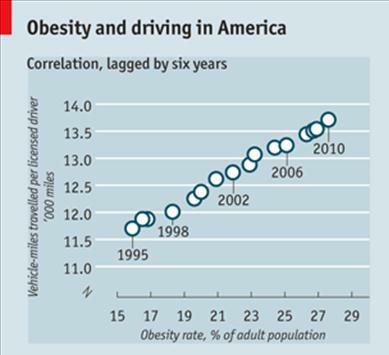 Clearly biology is a first-order factor in obesity, not driving. Per Jacob's link to the blog item on why we get fat, Gary Taubes lays out a mountain of evidence that it's carbohydrates -- sugar, flour, starchy vegetables like potatoes, apple juice -- that cause the insulin secretion that puts on fat. I'm a newspaper columnist and author and I spend my entire day seated and barely exercise, yet thanks to cutting out carbs, I am effortlessly thin. This morning, I had three strips of bacon and a cheese omelet cooked in butter. That, according to the evidence, is healthy diet food. Later in the day, I'll have a steak with heavily buttered green beans. More diet food. What I don't eat: bread, pasta, juice, etc. Oh, and I have the health stats (blood pressure, etc) of an elite athlete. Weight gain = calories in - calories out. Please spare us all this biochemical doubletalk. Driving doesn't make you fat. But going through the drive-thru, and eating while driving? That'll make you fat, big time, especially if it becomes a regular habit. Face it- foods that you can eat with one hand are seldom of the type that lend themselves to healthy living. I have yet to see someone handing over a container of carrots and celery sticks to someone at a drive-up window. Hmm . . . you mean STATISTICS LIE? Who'da thunk? I also think it is important to consider indirect causal links between policies and health outcomes (such as politics and culture), not just the direct ones. The authors don't get into this in their study, but it is important consider the factors of social pressures, advertising, funding priorities, redistribution of wealth, etc., and their impact on obesity, vis a vis driving's direct relationship to those factors. For example, as people drive more, they may be less likely to support funding for mass transit even if the need for mass transit is dramatically rising. The authors of the study point out its limitations very clearly, and their point is broader than one correlation. I would suggest reading the original article more closely before tossing it aside just because The Economist didn't do a good summary. Actually, Taubes lays out evidence as well that a calorie is not a calorie. Doctor Michael Eades also lays this out on his blog, proteinpower.com/drmike -- about how the body uses carb calories very efficiently but blows off non-carb ones (he uses the term "calorie wasting"). Also, eating animal fat and protein is satiating. On my morning omelet and bacon, I can go till about 3 pm without eating and not feel uncomfortable. Taubes also wrote a piece, supported by evidence, for New York Magazine, which shows exercise does not make you thinner; it makes you hungrier. People who don't know good scientific sources, and are simply posting scientific hearsay, always amaze me. Because you read it on CNN.com doesn't make it so. I use science in my work, and have learned to read studies, and trust very few people to interpret them. There are maybe five people in the world I trust. Dr. Michael Eades and Gary Taubes are two of them. In fact, Taubes is the single most skeptical human being I have ever encountered, and the most nervous about seeing that he is putting out evidence-based science. Well, you could just as convincingly argue that obesity is linked to the rise in computer usage. Oh, and inversely related to the use of mule-drawn plows...and black and white televisions...and non-homogenized milk. Or classics along these lines - Global warming vs. Pirate population.